REDDING, Calif. - Simpson University students, staff, faculty, and alumni will partner with community organizations in the university’s 12th annual Day of Service on Saturday, Sept. 24. The Day of Service is a start-of-the-year tradition at Simpson, where fall classes for traditional undergraduate students begin the day after Labor Day. 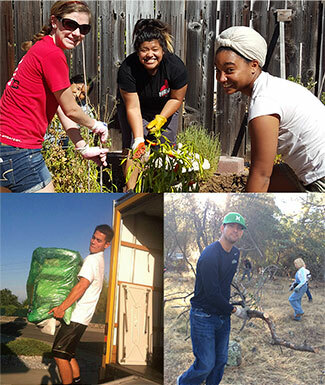 An estimated 100 students, staff, faculty and alumni will help with painting, gardening, litter removal, horse grooming, and other tasks at 10 sites throughout Shasta County, including the Martin Luther King Jr. Center, Compass ShiningCare, Heritage Roasting Company, CareNet Pregnancy Center, the Good News Rescue Mission, Whiskeytown National Recreation Area, and more. “This is a chance for Simpson students and employees to work alongside one another, on behalf of others, in the name of Jesus,” said Hannah Dewater, coordinator of community services. Last year, university President Robin Dummer began a faculty and staff day of community service that is now combined with the traditional student Day of Service. “In embracing the university’s motto of ‘Gateway to World Service,’ it is important to realize that we also belong to Redding and the surrounding community,” he said. In 2012, the Day of Service launched a year-round “way of service” initiative, where smaller Strike Teams—comprising Simpson students, staff and faculty—help out with immediate community needs throughout the school year. Since Strike Teams began four years ago, team members have served more than 6,000 hours on more than 225 projects, including cleanup, construction, moving, maintenance, and helping at large community events, including CASA’s Superhero Run, the Shasta Mud Run, and KIXE-TV’s Holiday Auction. Strike Teams have partnered with the Shasta County Probation Department, Homeless Rock Stars, and the American Red Cross on special community service projects. Strike Teams were recognized in 2015 with a California State Senate certificate of appreciation and Community Partner Award from Compass ShiningCare, in 2014 as a KIXE-TV Volunteer of the Month, and received a certificate of appreciation from the Great Strides Cystic Fibrosis Foundation in 2015. Learn more about Simpson strike teams at simpsonu.edu/striketeams.